How great it must be to exist in a moment where everything, almost no matter what, seems to run your way. And - yin and yang - for your direct opponent the experience must be simultaneously crushing. And it is. 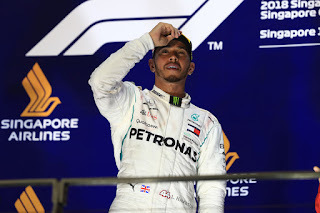 In this Singapore round Lewis Hamilton won again and Sebastian Vettel cruised home third; thus Hamilton's title lead is up to 40. Vettel is on the cusp of needing snookers. 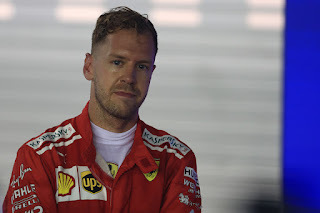 Worse for Seb and Ferrari it was not meant at all to be this way. This for Hamilton was the ultimate scrum won against the head, as not only was the Ferrari the quicker car in theory this has long been viewed as an outlying Mercedes bogey track. As it transpired Hamilton not only won but did so with something like comfort. Well, as comfortable as the working-out-for-two-hours-in-a-sauna Singapore race ever gets. "They put up a good fight this weekend," noted Hamilton afterwards of Ferrari. "I'm not sure where their pace disappeared to..."
In the practice running it appeared Ferrari would indeed be on top as advertised, as well as that Mercedes could even slip behind Red Bull - this high downforce track suiting it more than most. Yet in the last of qualifying Hamilton pulled a rabbit from the hat and blitzed everyone for pole - possibly even his best lap ever. An unhappy Vettel was nowhere near and sank behind Max Verstappen's Red Bull in the grid order too. And at this sinewy circuit grid order counts for an awful lot. "Yesterday was a lay-up; today was a dunk," added Hamilton aptly after his win. But even with what was said in the opening paragraph, F1 is never a matter of hocus pocus. "We've been just chipping away at it in the last 12 months," noted Mercedes technical boss James Allison about righting the car's bogey tendency at this track. 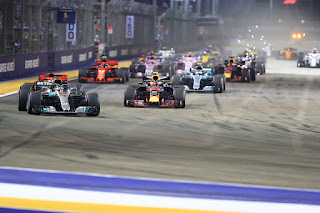 "It is an important weekend as we understood the car better," added Mercedes boss Toto Wolff, "but we must not take the foot off the gas"
We can add that Ferrari met the matter halfway. For a while it likely has had the best car as noted, but as we've also seen for a while operationally and strategy-wise it does not lead the way. And Vettel appears to know as much. 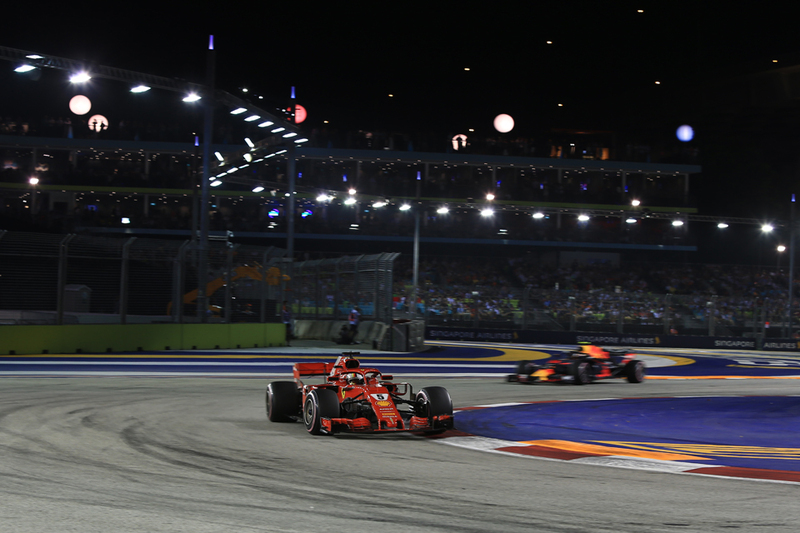 "There's no glaring errors," noted an observing Martin Brundle, "just little details, strategy calls..." And the trouble for Ferrari is that F1 outcomes tend to be decided in the margins. Further the Vettel-Ferrari relationship showed conspicuous strain this weekend, perhaps more than before. In both qualifying and the race Vettel questioned the team's approach from the cockpit, sometimes pointedly. How he must envy the likes of Hamilton who can just concentrate on the driving. "Overall, if you see the gap in the end it is clear that we were not fast enough today in the race," Vettel said, stony-faced. "We need to understand why. Obviously it's largely due to how we decided to race, on which tyres, for how many laps etc..."
Hamilton also hinted at intra-team operations making the difference. "Even coming into this weekend we still felt that they were [Ferrari was quicker], but we are more united," he said. "I think I've got the smartest group of guys in my team and they're all bringing their A-game. 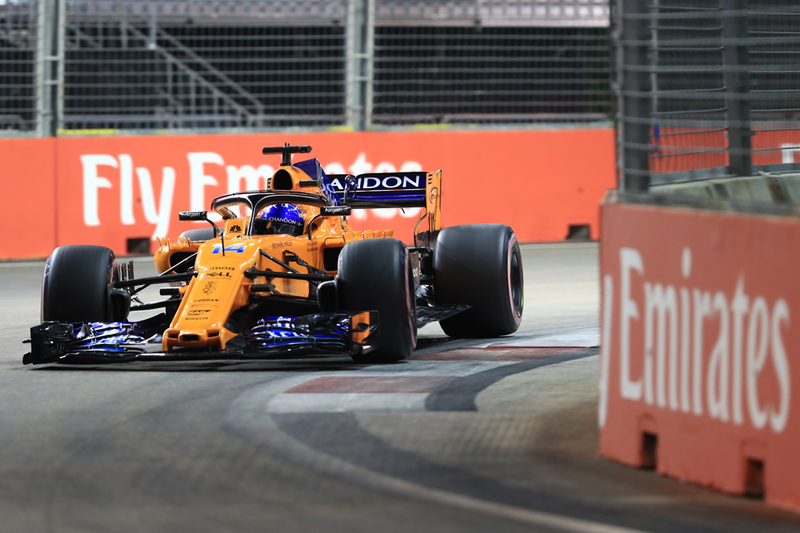 So unless you're [opponents are] coming up straight with your A-game..."
He also sought to explain how Mercedes at last got the Singapore monkey off its back. "We've come here optimistic that we could do a good job, but we didn't know [how it would go]," Hamilton added. "Looking at our history here, for months we've known it was coming, we knew it was going to be difficult. "We're constantly working and evolving and understanding this car. Our understanding of the tyres, that's helped us as well. My communication I would say with the debriefs has been greater than it's ever felt for me, in terms of really pinpointing where our car could be stronger." For a time in the race it looked though like Vettel might salvage something from the rubble. He got by Verstappen on lap one, just before an early safety car was called. Then Ferrari sought to force the issue with Hamilton in the solitary stops by pitting Vettel first, seeking an undercut. Its effect was counter-productive though, as he dropped into traffic - races here are follow-my-leader for the most part - which both let Hamilton stay ahead after he'd pitted and in turn allowed the later-stopping Verstappen to vault back past too. Worst of all Vettel in this strategy play had bolted on the ultra-soft tyre, not the soft that his two rivals had, which was not as good to make it to the end (though he at least managed that). From that point on Vettel faded. He finished third over half a minute off Verstappen and nearly 40 seconds off the winner. Verstappen instead was left to do the chasing of Hamilton, which he did with his usual enthusiasm. Indeed at two-thirds' distance he even, fleetingly, had a chance to pass as they picked their way through a pack of warring, distracted, backmarkers. But turn 10 isn't suitable for such things and the moment passed as swiftly as it arrived. Otherwise the imperious Hamilton was well in control. Championship-wise he now has similar status. The rest followed them home also in grid order after only minor adventures along the way - Valtteri Bottas fourth, Kimi Raikkonen fifth, Daniel Ricciardo sixth. There was more fun further back. 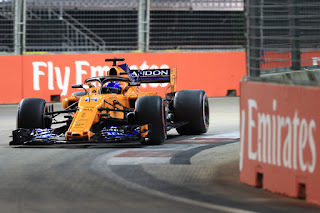 Fernando Alonso not for the first time showed his class by coming home seventh and was the only one outside of the untouchable big three teams not to be lapped. He now has 50 championship points, only three shy of 'best of the rest' and a higher total than plenty in superior equipment. F1 will miss him. So will McLaren. He was helped by a few cars around him making a similar mistake as with Vettel by pitting early and dropping into this place's notorious traffic jam. This resulted in them being held up for about four hours by Sergey Sirotkin's Williams, which Sergio Perez eventually sought to resolve by driving into him in a clear fit of temper (it got him a puncture and penalty). Of those who chose the wrong path, Nico Hulkenberg at least recovered to take the final point for 10th. Carlos Sainz's fellow Renault and the soon-to-be-promoted Charles Leclerc's Sauber took the places between in eighth and ninth respectively. To return to where we came in, given everything the championship destination is beginning to establish an air of inevitability. Though as Wolff intimated such things can change quickly - six rounds remain and a non-finish for Hamilton will change the complexion. But we're reaching the point that Vettel needs something like that. And for him to prevail in this title race momentum - and points - would not be the only things that have to change. Sirotkin's evening is a bigger story. To be honest I couldn't really see what was so heinous about Sirotkin's defending of his place in that race, although admittedly I'm not sat in the cockpit on the receiving end of it.